Polk City occupies an area of 4.47 square miles in the center of Iowa. It has a population of 3,418, which has increased by over 1000 in the last ten years. It incorporated in 1875. 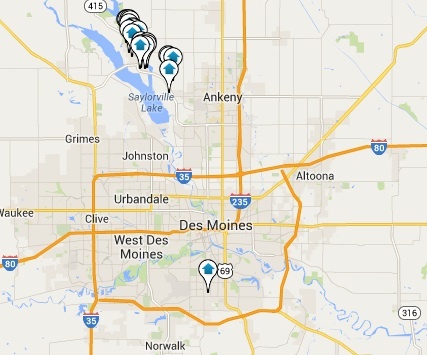 Polk City may be tiny, but due to it being a part of the Des Moines Metropolitan area it has plenty to offer. The city is perfect for raising a family. The town sits next to Saylorville Lake which has a marina and beaches. This is a city that loves the outdoors. It also has a Town Square where there is a weekly farmer’s market as well as other community events. Homes in Polk City are mainly single-family dwellings, but there are condos and townhomes available. The median age of the real estate in Polk City is about 26 years. There has been a lot of new construction of custom homes over the past few years. The Polk City real estate market is healthy right now. The median value of homes in Polk City is currently $215,400. Prices have gone up 3.4% in the past year and are expected to rise another 2.0% over the next year. The median list price per square foot is $159 which is higher than the Des Moines average of $121. Now is the time to buy a home in Polk City. Houses are still affordable and you’ll increase your investment almost immediately. It’s a beautiful community, perfect for those who love the outdoors.